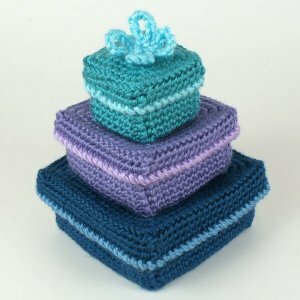 Gift Boxes is an original PlanetJune Accessories crochet pattern by June Gilbank. 3 sizes of pretty nesting boxes with matching lids are perfect to use as gift boxes at Christmas and throughout the year. They also make stylish decorative boxes for organising and displaying small trinkets. This pattern is worked in the round (amigurumi-style, in a spiral with no joining or turning) and uses an innovative technique to create real square corners with no sewing required! Sample boxes used Bernat Satin yarns because I like the sheen and the beautiful colours, but a harder, more robust yarn (e.g. cotton), would create stiffer, more rigid boxes. Details: Pattern is 10 pages long and includes full written instructions including a clear explanation of the new crochet stitches. I also provide a complete step-by-step photo tutorial at the end of the pattern (you can save ink by omitting the 3 tutorial pages when you print the pattern, if you prefer). Date Added: 10/31/2013 by Lisa S.
Date Added: 01/29/2013 by Rebecca H.
Date Added: 09/18/2012 by Judy C.
Date Added: 12/01/2011 by Rianne d.
Date Added: 11/29/2011 by Sandra Å.